The young web app Ludus brings back the fun to presentation design, and the fun of consuming it. Not only designers should definitely take a closer look at the tool. You get yawny as soon as you hear the word “presentation”? If that’s the case, you’re one of the people that have been working here for a while. Those who have been working since the nineties know what I’m talking about. Since the beginning of the nineties, everything was presented exclusively using Powerpoint. It didn’t even matter if the topic benefited from a supporting presentation. Whatever! It was possible, so we did it. Every good and every lousy orator used the dinosaur from Redmond, to support their more or less shaky theses with a mostly awful design. Until today, Powerpoint has only evolved very slightly, and it has become the replacement for the overhead projector of the eighties. 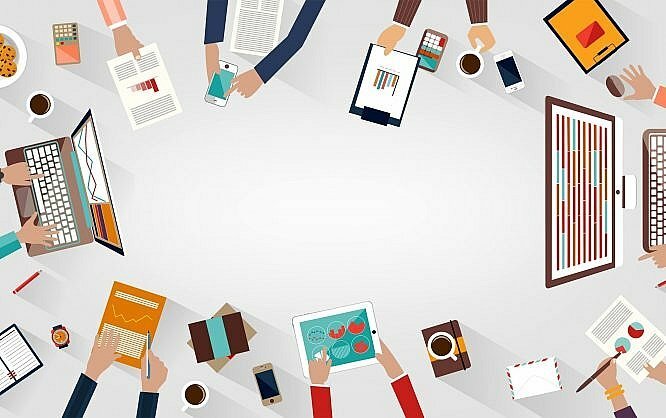 However, not only have the expectations regarding modern presentations increased drastically; the technological options have evolved as well. By now, we even have alternatives, like Apple’s Keynote. But none of the desktop giants make appropriate use of the new technological possibilities. Thus, it makes sense to consider a web-based alternative to the aging incumbents. 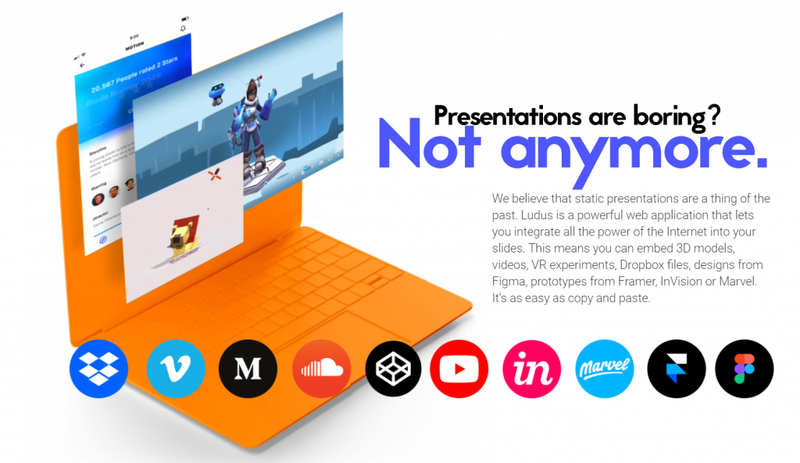 The makers of Ludus didn’t stop there, though, and came out with a solution that sums up what modern presentation solutions are capable of. Ludus not only removes the conventional problems of each desktop presentation software, like difficulties when sharing the massive files, or the usage of different computers among the recipients of the presentation. Above of all else, Ludus brings flexibility to the table, which can not be achieved by locally created proprietary files. Ludus is already able to integrate existing web content into the presentation via drag & drop or copy & paste. This allows users to combine forms with YouTube videos, or implement animated Gifs from GIPHY. Everything you can find on Google can be used in Ludus. This is a bit simplified but true at the core. After all, the Ludus team thinks of the web as a pile of Lego bricks, which can be turned into something pretty with Ludus. 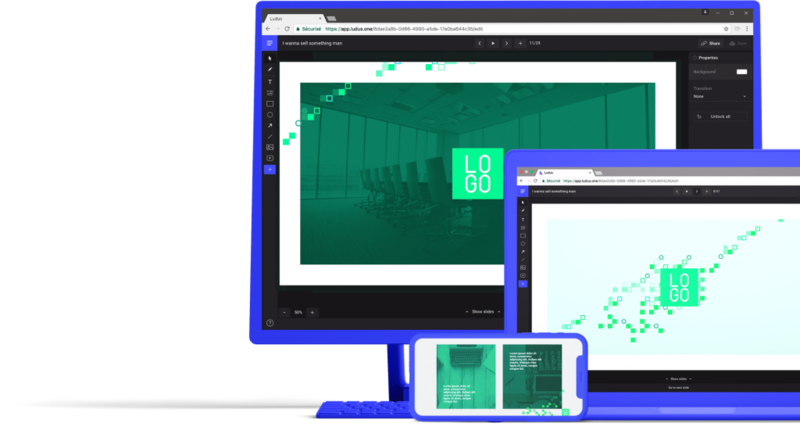 With that in mind, it is also very fitting that you get to use Ludus on every device – for both creation and presentation. Ludus integrates images from Dropbox, Flickr, GIPHY, Instagram and Unsplash, fonts from Google Fonts, Typekit, or your computer, pictograms from Icons8 and The Noun Project, as well as videos from Youtube, Vimeo, Streamable, Wistia and Vid.me. 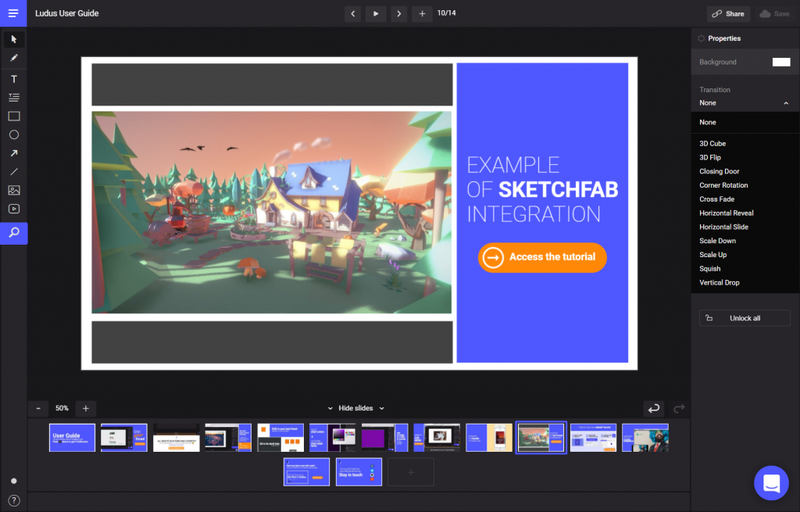 It is also possible to implement your content from InVision, Framer, and SketchFab. Even 3D models and VR experiments can be used in your Ludus presentation. The operators behind Ludus only think of this pretty long list as an entry point. Their role model is Slack, which has a solution for almost anything since it was opened for the third-party developer market. In contrast to other presentation tools, Ludus is not only able to compile materials from different sources. The software also has its own design tools, which exceed the means of average slideshow software. Especially designers can go ham, and realize all of their specific design ideas. Those with Sketch experience will feel right at home in Ludus, according to Vincent Battaglia, the CTO, and co-founder of the project. To me, the interface is very reminiscent of an Adobe product. Ludus is available in a free version, which is limited to one user and does not allow for collaborations. The number of presentations is limited to 20. This is the maximum number stores in Ludus. In the free version, you can only export your presentations to PDF format. At least, you have access to one gigabyte of storage, and you don’t need to forgo any editing features. So, assuming that you save your presentations as PDF, and don’t work on more than 20 of these audience tormentors at once, the free version should be sufficient. If you don’t want to be limited regarding the number of presentations and wish to have access to an HTML export of your work, you need to grab the wallet. For 99 USD a year, you also get to protect your presentations with a password, create an easy to remember URL for each project, and gain access to more storage. This would be the pro account. Teams with up to ten users have to pay 499 USD a year, or 49 USD a month. In return, they receive the collaboration feature, allowing them to work on presentations together. By the way, the term Ludus originates from Latin and describes an educational institution that children in ancient Rome used to visit to learn playfully. Recently, Ludus was made available to the public and can be used by anyone. So take a look at the Powerpoint of the future. A great info about latest technology in presentation software. Kindly, I still use Powerpoint in designing my presentation, but very lack in configuring animation and not many interesting template provided. I would like to know more about Ludus and compare to Powerpoint.